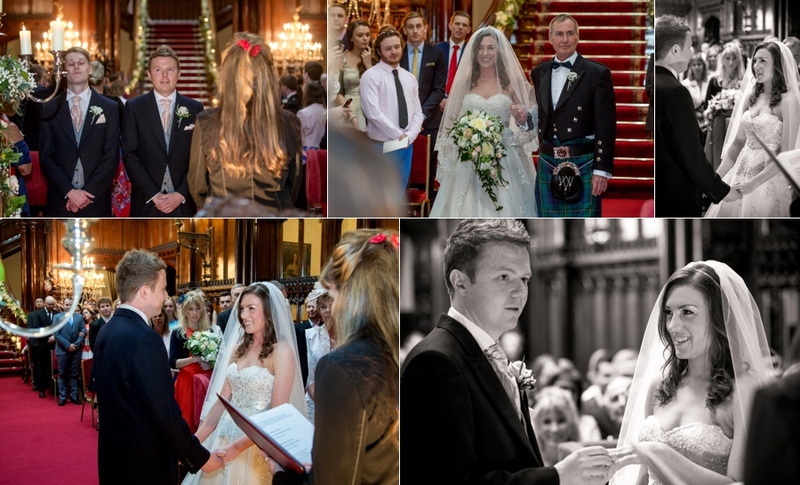 Andy and Sarah were married earlier this year in a civil wedding ceremony in Allerton Castle’s spectacular Great Hall. 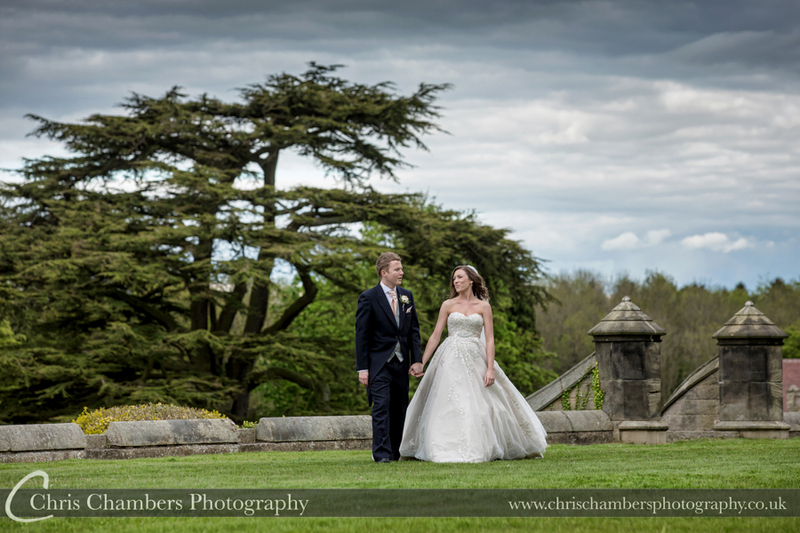 We arrived to an overcast and slightly tempestuous sky, perfect as a backdrop for dramatic wedding photographs! 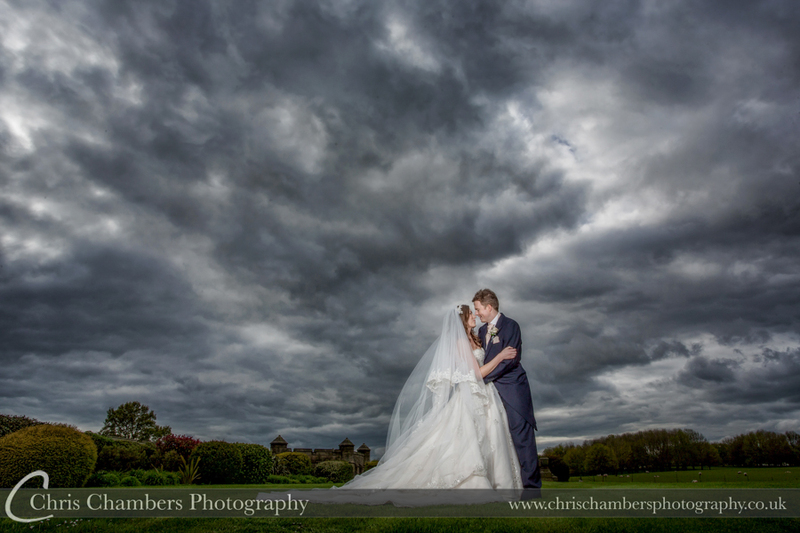 ( We often hear brides comment how moody skies are what they wanted for their photographs). 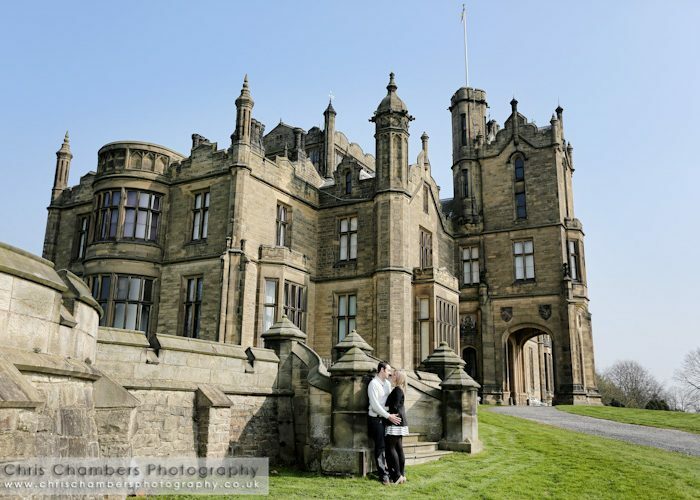 Our first job on arrival is to create the establishing photographs, the ones of the wedding venue inside and out, although we photograph a number of weddings at Allerton Castle each year we still like to create new castle images each wedding day – Below: Allerton Castle and the Great Hall set ready for the civil wedding ceremony. 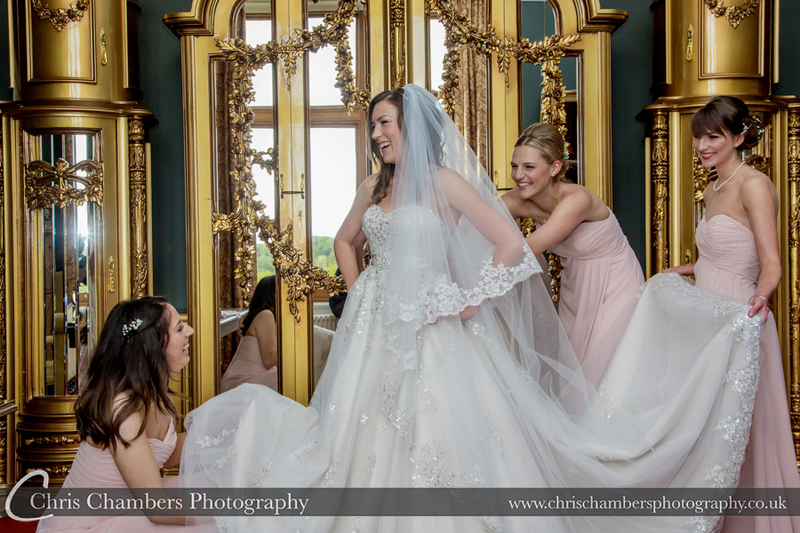 Following our interior and exterior venue photographs we headed up stairs to join Sarah and her bridesmaids during their preparations in the Palace Suite. 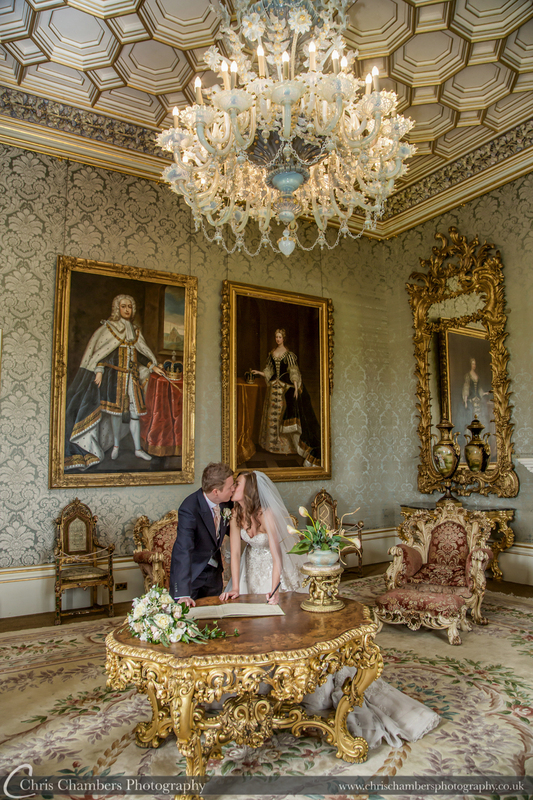 The bedroom at Allerton Castle lends itself perfectly to bridal preparations and lots of locations for photographs. 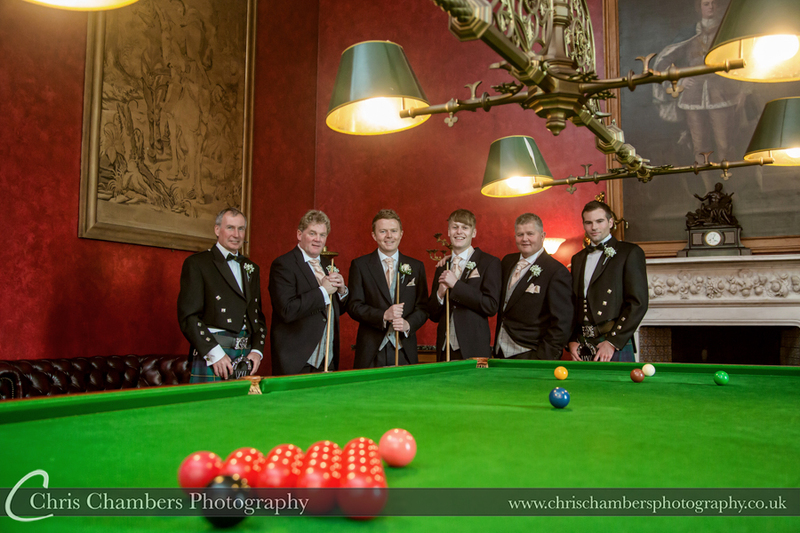 Andy and his groomsmen arrived around an hour before the wedding ceremony, we joined them in Allerton Castle’s Billiard room for some pre-ceremony wedding photographs. 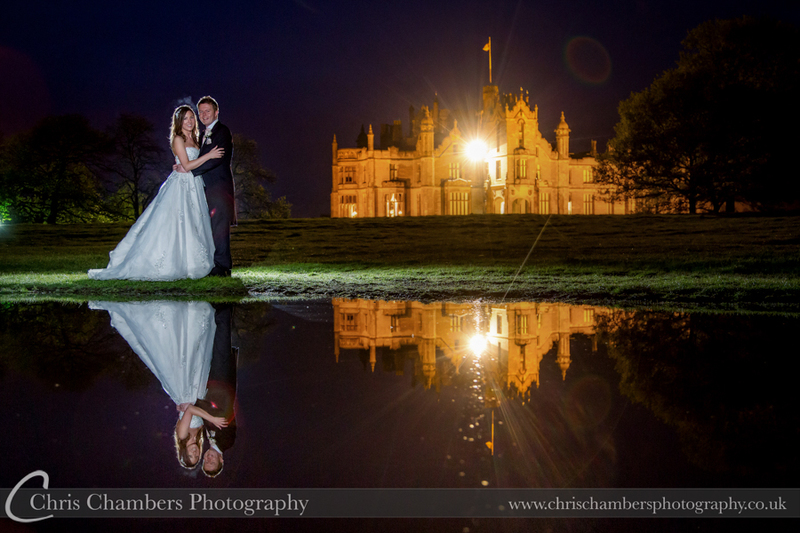 After a few posing photographs at the table we ventured outdoors before the guests arrived to catch the guys against the castle backdrop. 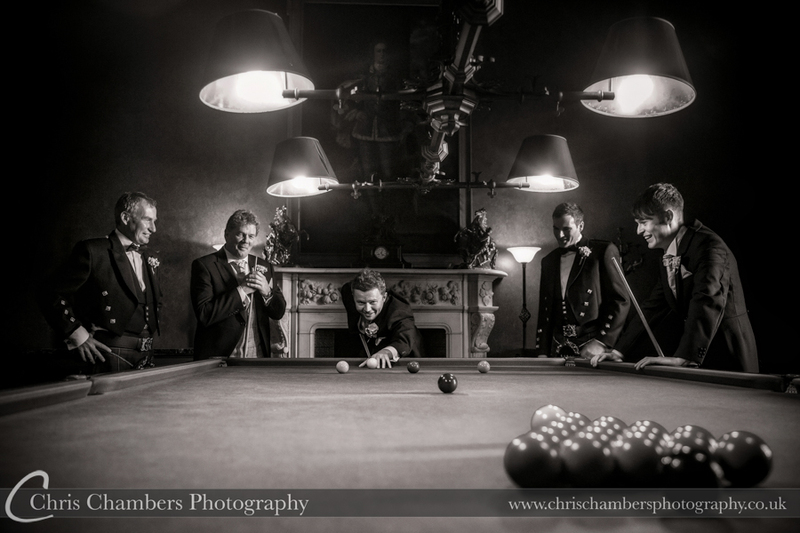 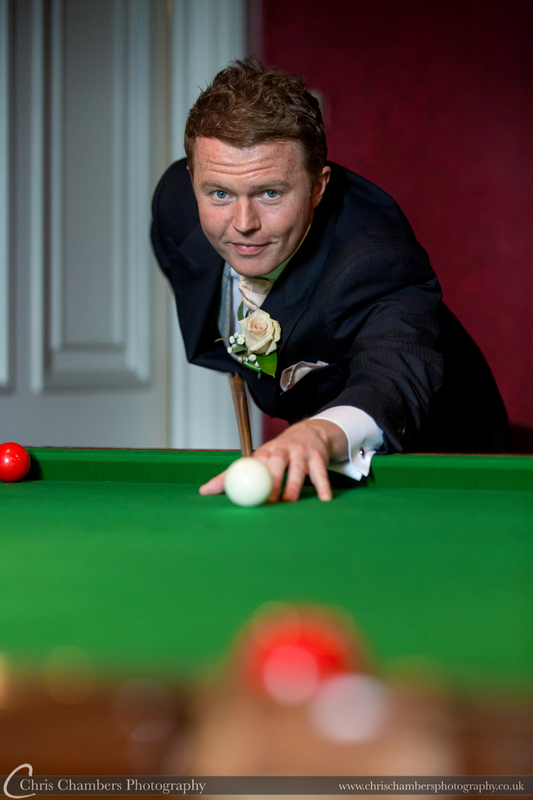 The wedding photograph below of Andy and his groomsmen at the snooker table was awarded a Silver in the Guild of Photographers image competition. 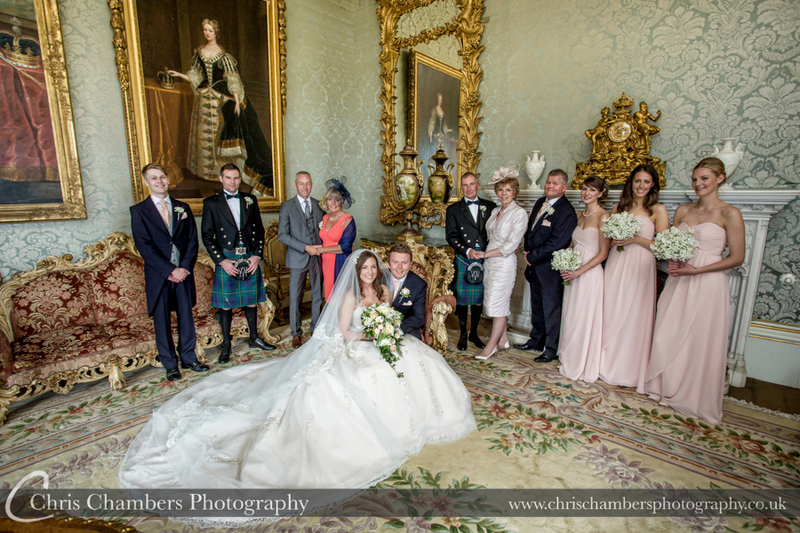 With the wedding ceremony taking place at 2PM we were back in the Palace Suite with Sarah and bridesmaids awaiting her fathers arrival to collect her ready for the ceremony. 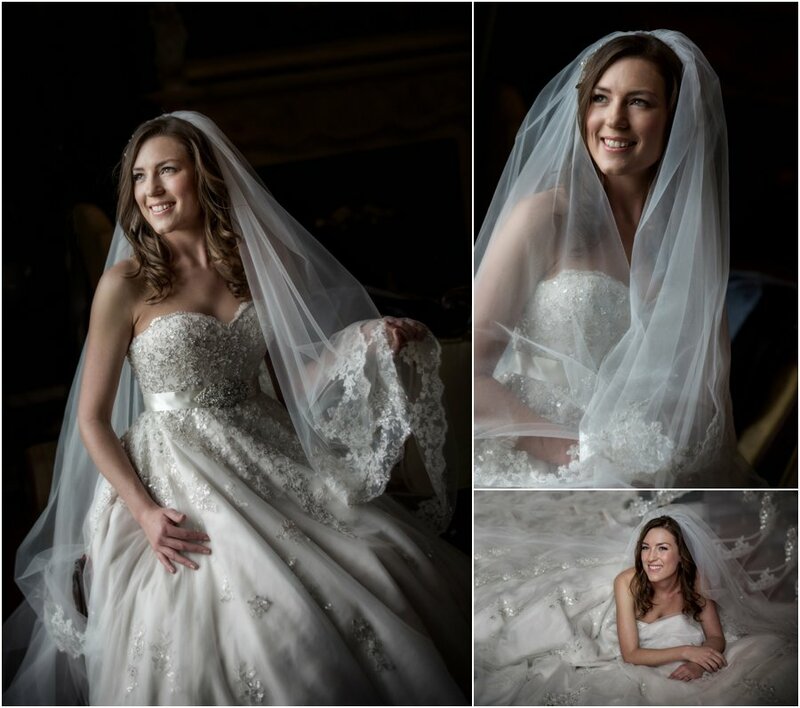 It’s always an emotionally charged moment as dad sees his daughter for the first time on the wedding day and wearing her wedding dress. 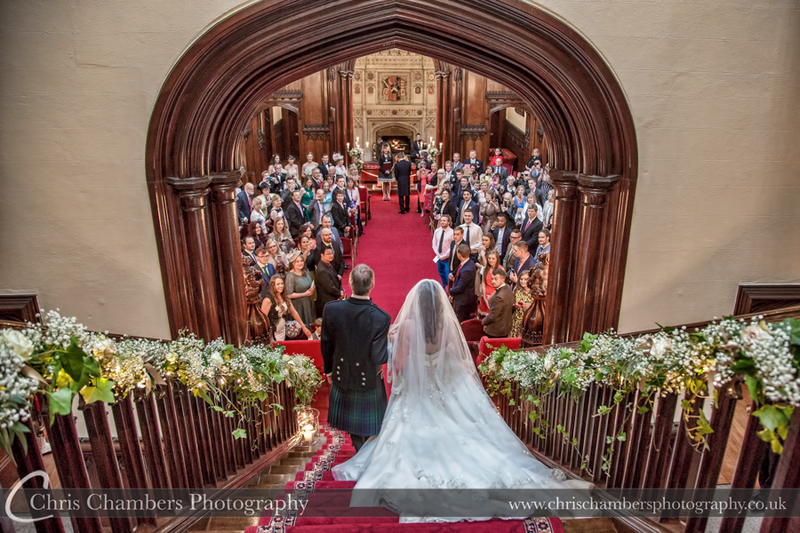 Today dad didn’t disappoint and we able to capture some great reactions and emotion before they made their way down to the Great Hall where Andy and weddings guests were waiting. 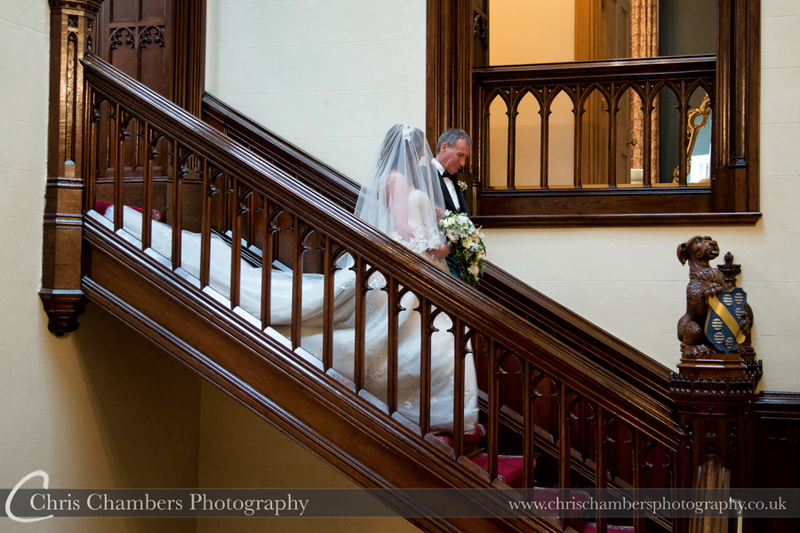 Sarah and her father make their way down the main staircase to enter the Great Hall for the civil wedding ceremony. 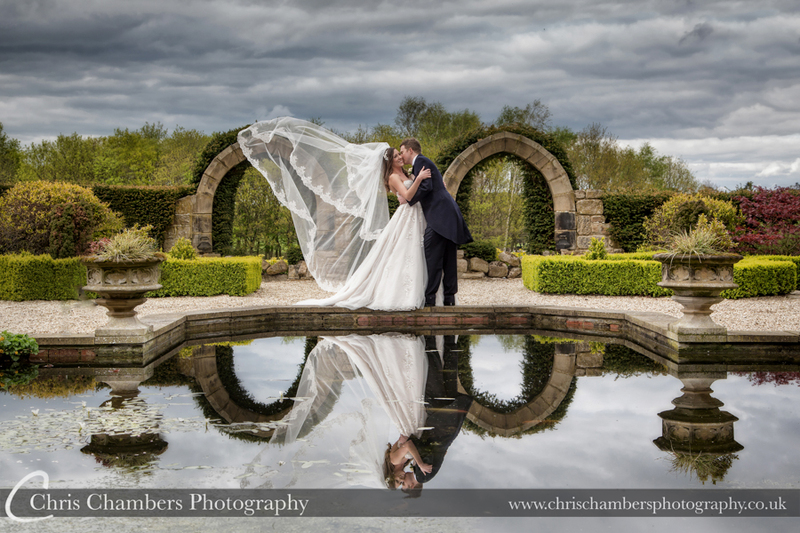 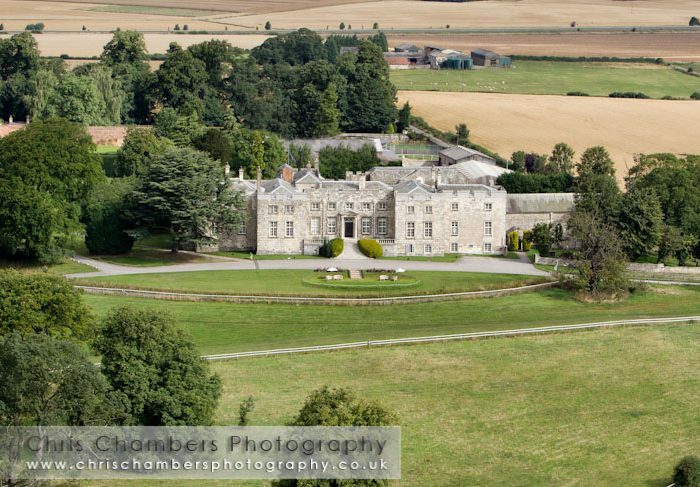 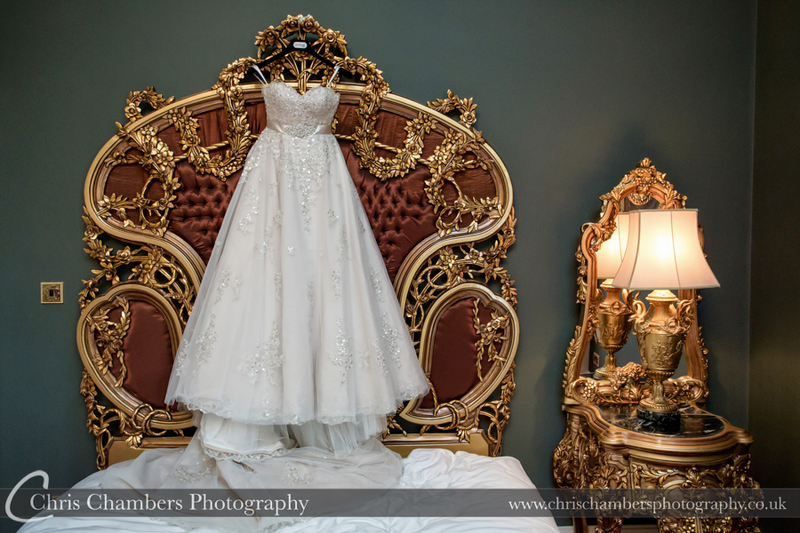 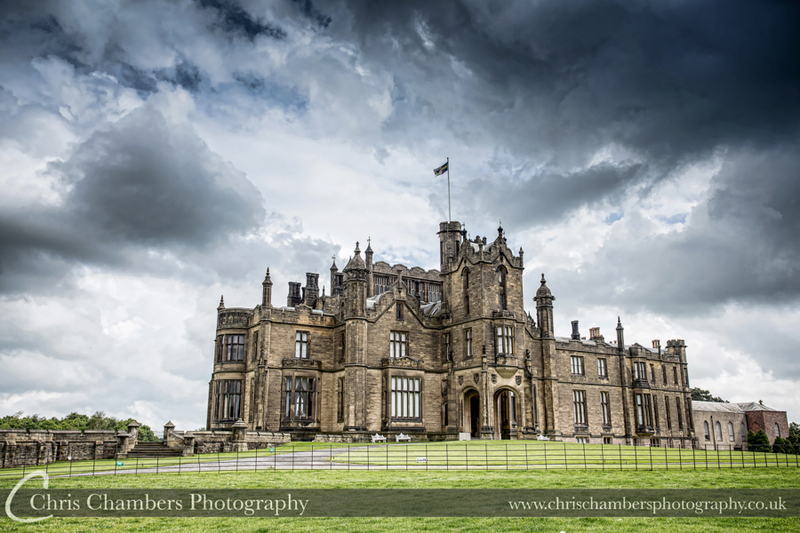 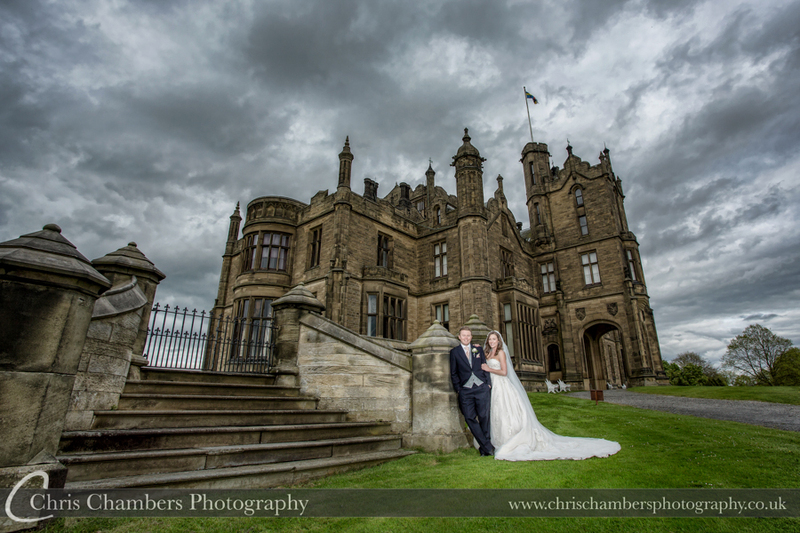 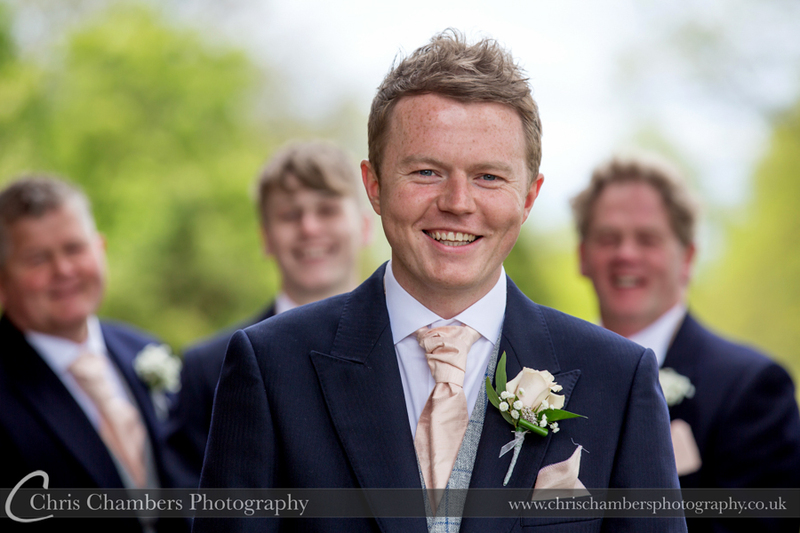 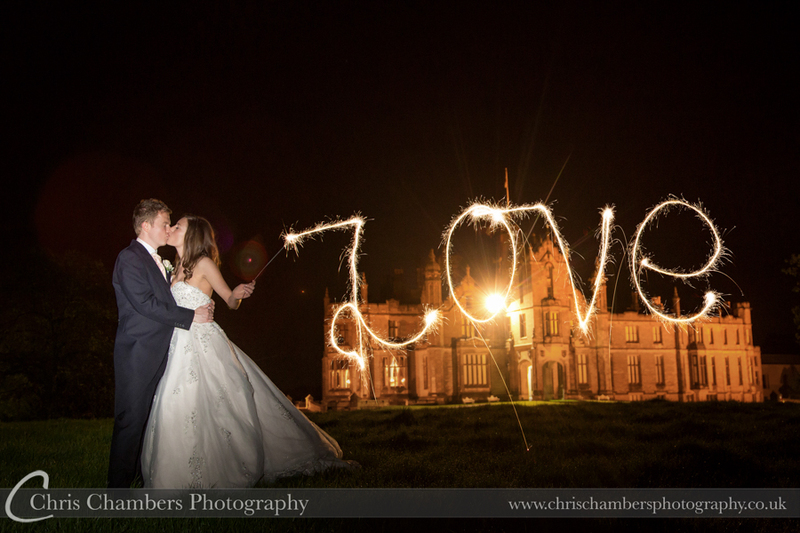 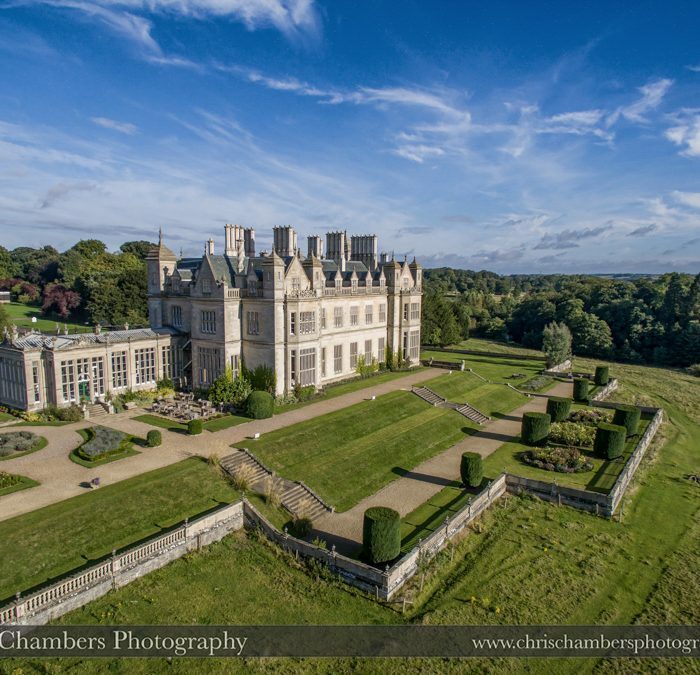 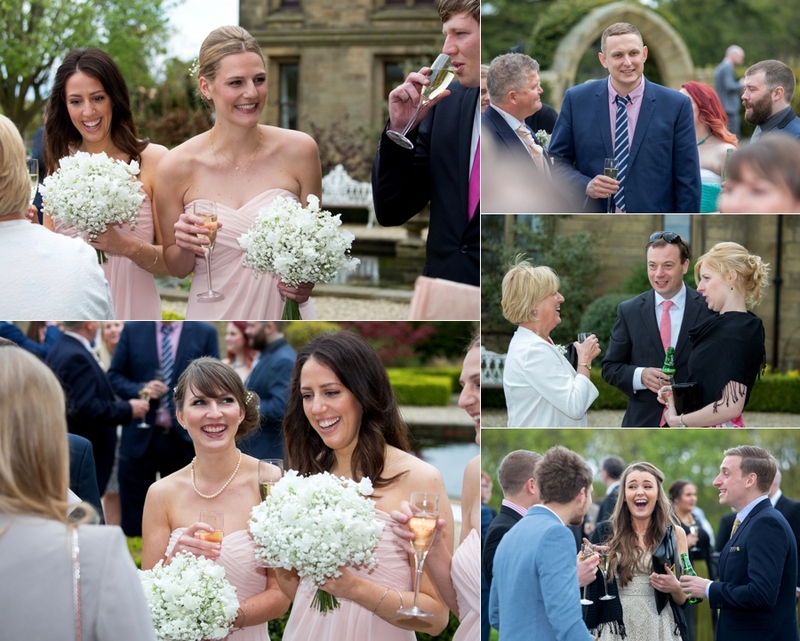 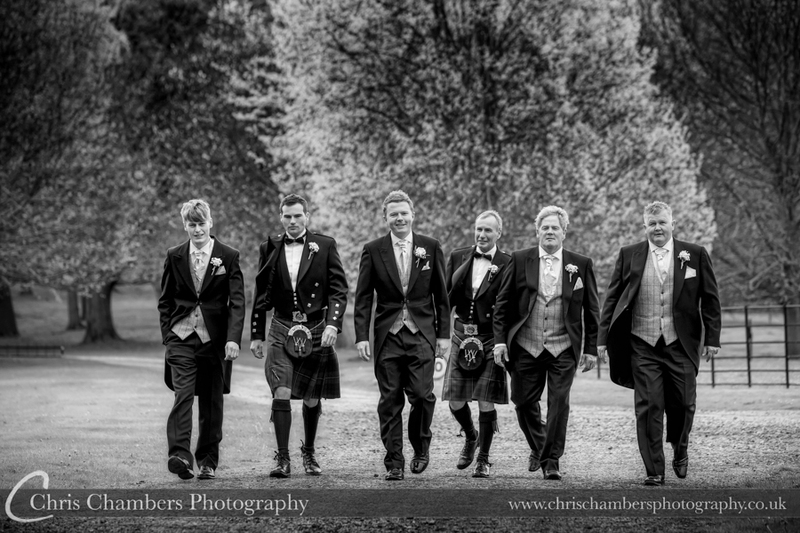 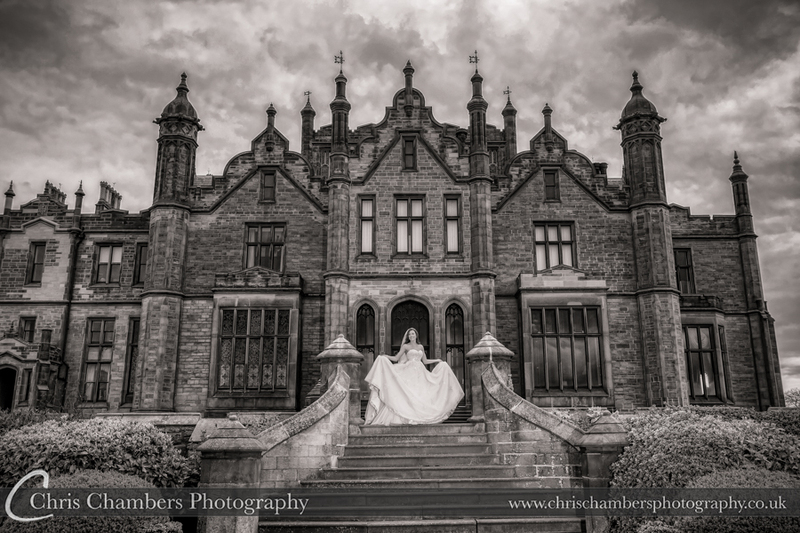 Allerton Castle wedding photography from Yorkshire wedding photographer Chris Chambers. 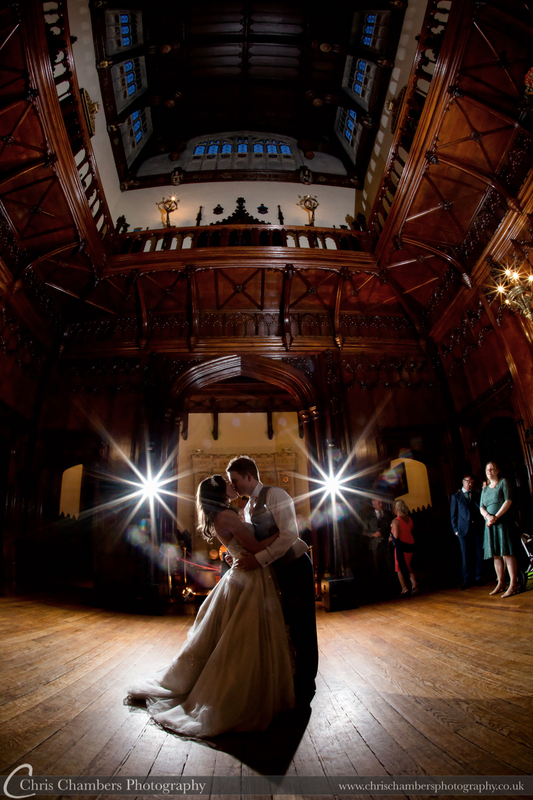 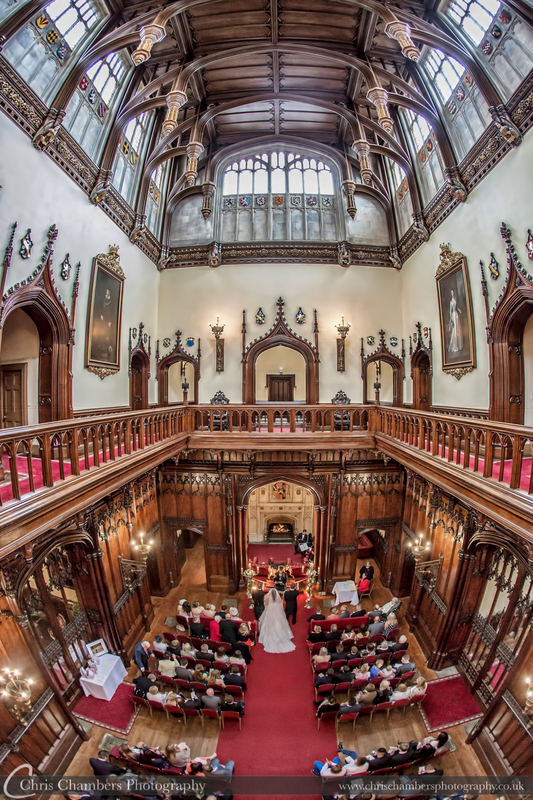 There can be few finer wedding rooms than the imposing hall with it’s 80 foot high ceiling, deep wood panelling and grand entrance staircase, factors that make it so good for creating amazing wedding photographs. 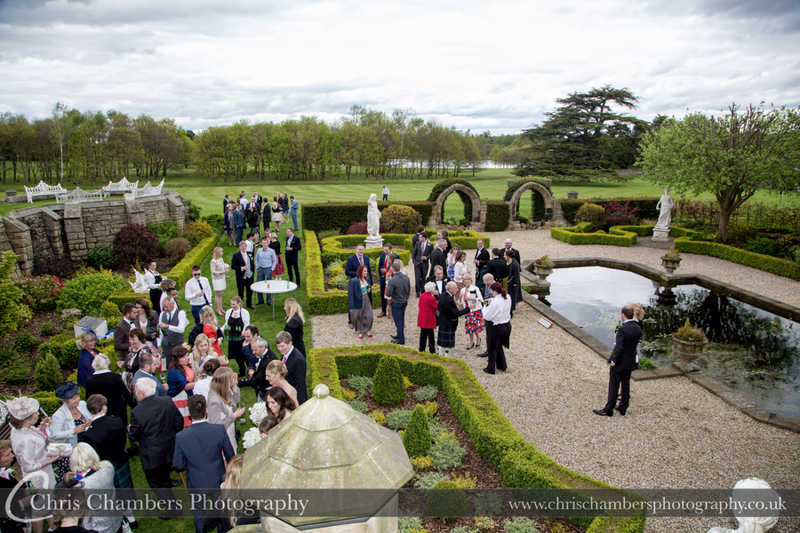 Following the wedding ceremony and signing of the register it was time for the drinks reception and wedding photographs in Allerton’s Memorial Garden. 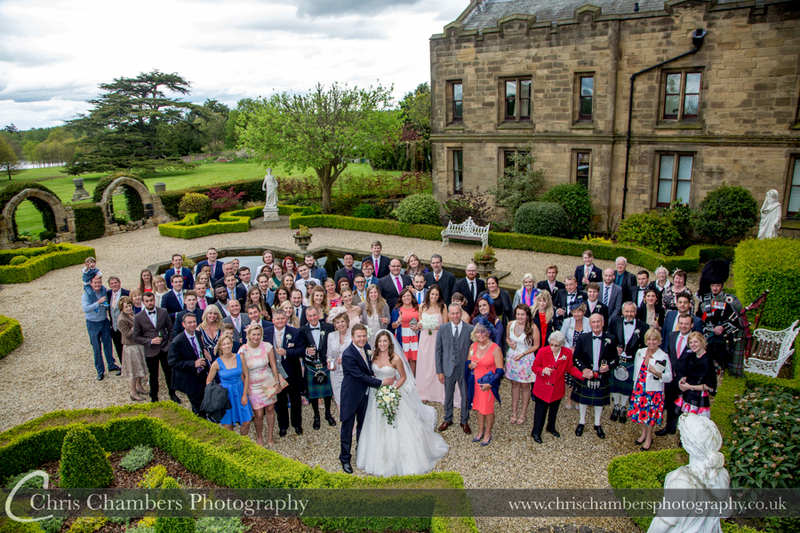 After completing the group wedding photos we took and Andy and Sarah for a short walk around the castle to create a number of photographs of them alone and with their bridal party. 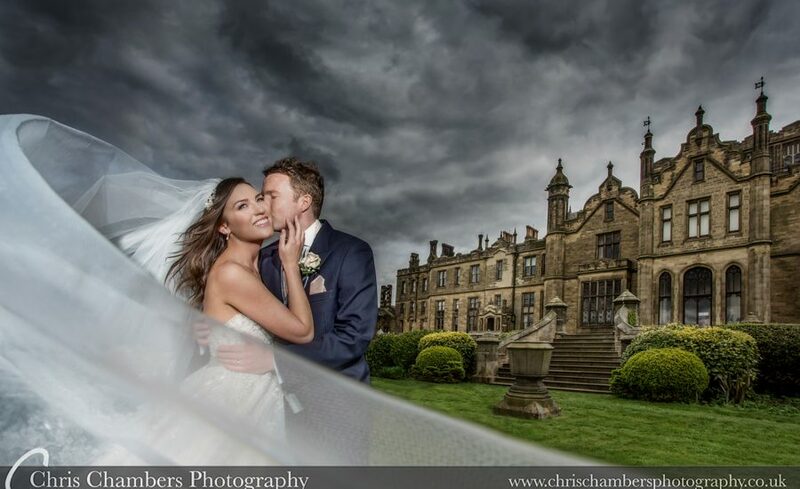 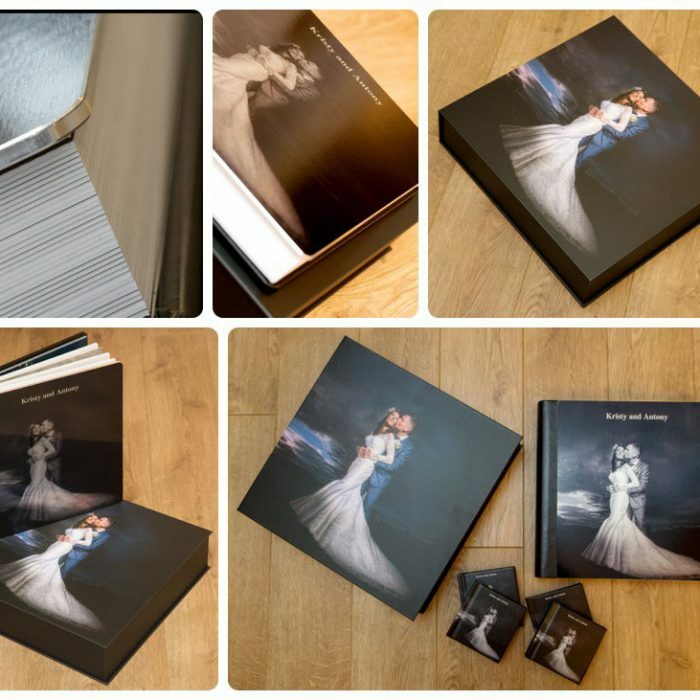 Sarah’s veil made the ideal wedding photograph prop and with the imposing Allerton Castle in the background we were able to create the above award winning wedding photograph which scored a Silver in a recent Guild of Photographers image competition. 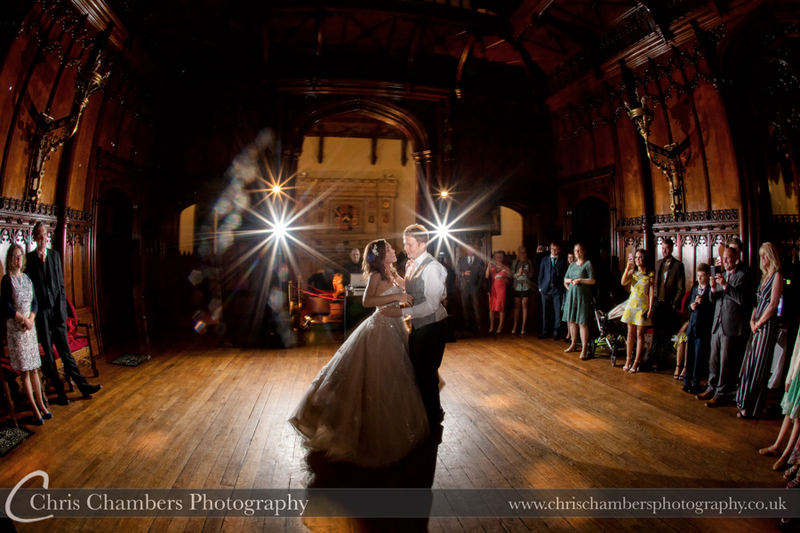 First dance in the Great Hall. 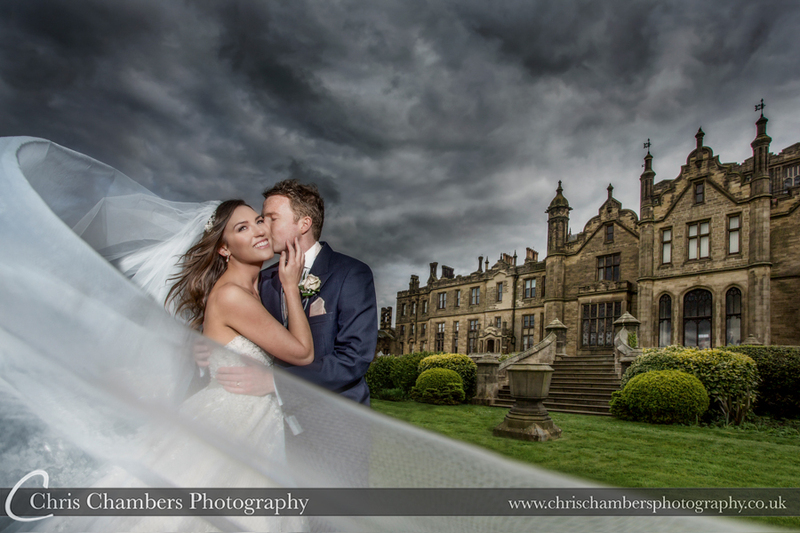 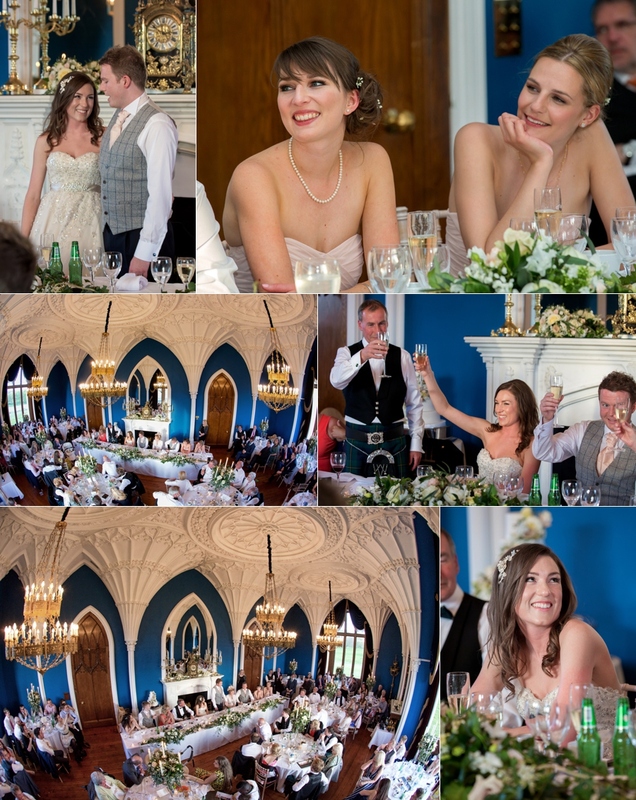 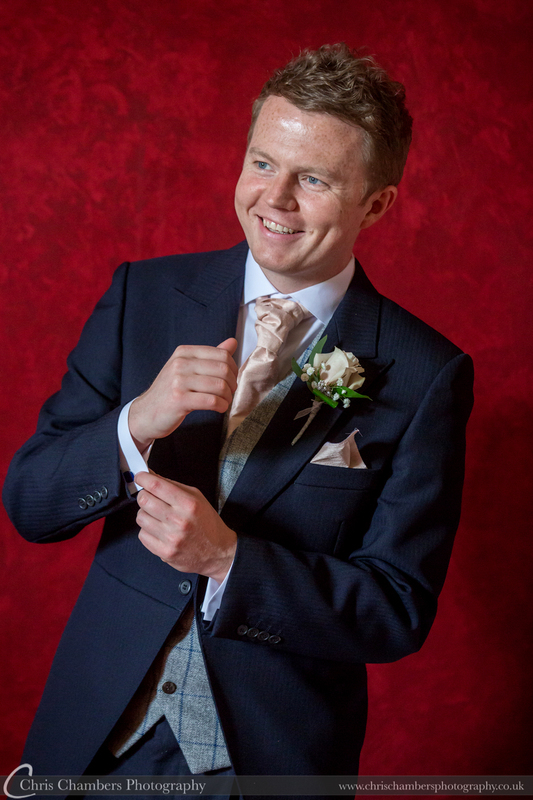 Allerton Castle wedding photographs. 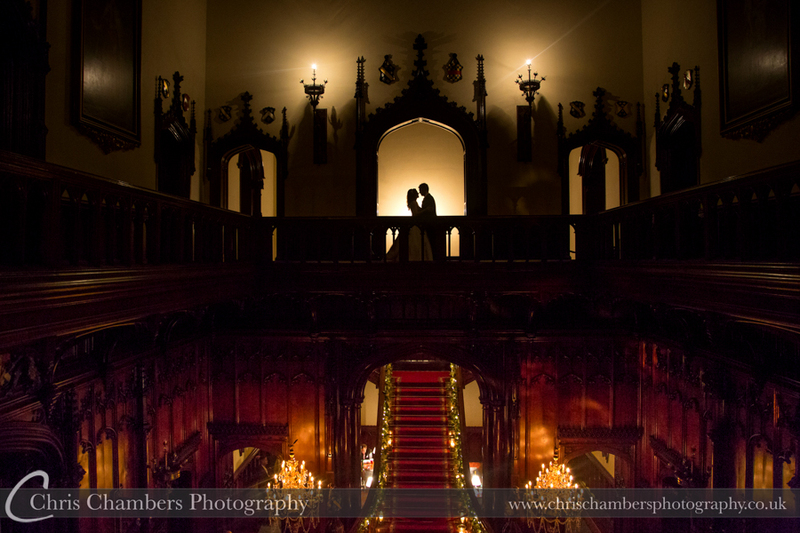 Allerton Castle is well lit in the evening and creating after dark wedding photographs is a must and a great end to a wedding album.